Artificial intelligence (AI) has quickly become a popular and groundbreaking technology for businesses across a range of industries. Learn how it impacts marketing teams. The marketing sphere has been eager to adapt AI technology into its everyday operations. Marketers can leverage the power of AI to gain valuable insights about their customers, automate routine tasks and improve day-to-day or project workflow. In fact, Salesforce reports that more than 50% of all marketers are currently using AI, and an additional 27% expect to incorporate the technology into their work by the end of 2019. You can use this article to learn how AI is transforming marketing, and how marketers can benefit from using AI. Movies and science-fiction novels often depict AI as robots that threaten to take over the world, but modern AI has been used to solve a wide range of problems for enterprises in health care, retail, sports, and more. At its core, AI makes machines capable of solving problems as well as – or better than – people can. AI systems can learn from experience, adjust to new inputs, and perform human-like tasks automatically. AI works by assessing large sets of data with fast, iterative processing and detailed algorithms, which allows the program to learn and adapt from patterns or features in the data. For decades, programmers coded software in structured ways to provide consistent outputs, but now, computers are capable of learning without a rigid set of rules. This describes a subset of AI commonly called machine learning. Marketing experts have touted the need for personalization, dynamic engagement, and responsive and adaptive design. AI helps marketers engage consumers in way they now expect and prefer. As marketing professionals collaborate with intelligent technology to connect with consumers, those consumers feel compelled to remain engaged. How Are Marketers Using AI? Marketers are already using AI to power their content and improve the efficiency of their workflows, and more plan to do so in the future. 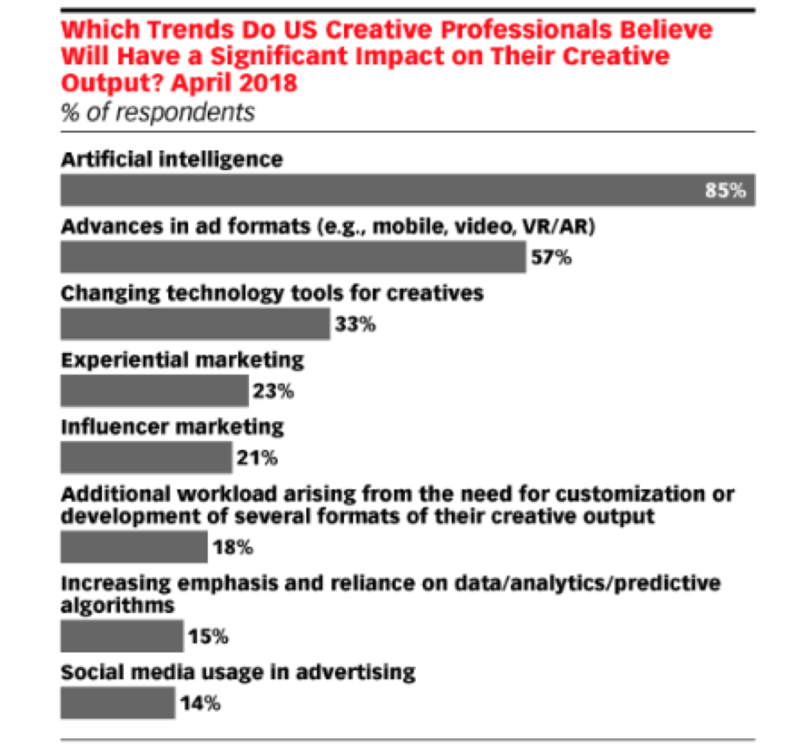 More than 80% of creative professionals, including those in the design, art, film, video production, and advertising industries, believe that AI will have a significant impact on their creative output in the next two years. No other emerging content creation trend, such as experiential marketing, influencer marketing, or social media marketing, is expected to have an impact as significant as AI. Artificial intelligence has the power to change the way marketers approach creative work and create content. Content creation in marketing requires that marketers produce relevant and consistent material to attract and acquire a clearly defined audience. It’s important that the content produces value in the eyes of the customer, which can be difficult for marketers to achieve. Fortunately, AI gathers customer insights, which can ensure that marketing content is neatly tailored to customers’ preferences. Soon, AI might change the way products are advertised. In 2017, Coca-Cola Global Senior Digital Director Mariano Bosaz told Adweek that he wanted “to start experimenting [with] automated narratives,” including using AI to compose music and edit the closing credits of commercials. Additionally, social media platforms including Facebook, Twitter and Instagram already use AI to customize users’ news feeds, only displaying posts that are relevant to their predicted interests. These social networks use algorithms to analyze hundreds of variables and can predict with eerie accuracy which posts users will like, comment on, share or mark as spam. Marketers can use this data to create content that is most likely to engage users. For example, marketing technology firm Emarsys targets customers via highly-targeted social media ads. Through their product Social Ads, users can take the target segments they use for email, mobile and web communication and let Facebook build corresponding custom audiences from the contacts it finds. Not only is the social media budget spent where it is most effective, but this also creates a true one-to-one experience for customers. Marketers can utilize this data to create optimized social media content or advertisements that will pique the interest of targeted consumers. The ads, as demonstrated in the photo above, are highly personalized based on what each custom audience member finds most appealing. Thanks to AI, marketers can use data to create effective, targeted content. AI offers ways to deploy effective personalization tactics without draining marketing budgets. 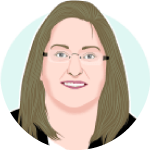 Personalized content engages customers and encourages customer loyalty. Marketers can use AI to gain a deeper and broader understanding of customer segments. AI allows marketers to develop customer personas based on continuously-evolving data about their current customers, eliminating guesswork and delivering higher ROI. AI tools can capture data about each online interaction with your business, tracking changes in behavior, location, and other factors that enhance personalization. Studies show that consumers are more receptive to personalized marketing. In fact, 73% of consumers prefer to do business with companies that take their personal preferences into consideration. Personalized marketing builds stronger relationships and can generate more revenue over time. Software company Dynamic Yield utilizes AI to observe “how each customer segment interacts and engages with different content.” Studying this behavioral data ensures that marketing tactics are relevant and engaging for each specific segment. Tailoring content, products and services for each customer can provide a significant return on investment for marketers. For example, incorporating a customer’s name or other personalized information is more eye-catching to consumers and is more effective in converting sales. The two screenshots above depict both a generic and personalized advertisement. The personalized message is likely to yield a more favorable response from customers, because they feel more personally connected. Additionally, marketers can use AI to create customized, natural marketing content that is subtly tailored to each targeted segment that receives it. AI-powered marketing provides a personal experience for each customer as their tastes and interests evolve. AI is expected to increase workforce productivity levels by at least 40% by 2035, so it’s no surprise that it’s become integrated into even the simplest of everyday tasks. AI can make marketing tasks more efficient and easier to complete. Many marketers find that AI improves their workflow by handling repetitive or tedious tasks. Common office tools like Office 365 already offer AI-powered features. For example, PowerPoint Quick Starter uses the Bing Knowledge Graph to provide AI-curated outlines for any topic, including recommendations on the kind of information to include, categories to consider and associated images to feature. Carl Landers is chief marketing officer at Conversica, a firm that creates AI sales assistants. “We're trying to use AI to automate routine conversations that businesses have with their customers or prospects, in the hope of freeing up humans from doing kind of mindless, repetitive stuff,” Landers said. Conversica's virtual sales assistant can automate routine back-and-forth conversations, such as scheduling calls. Conversica’s interface, which is depicted above, is simple for users to navigate and manage. 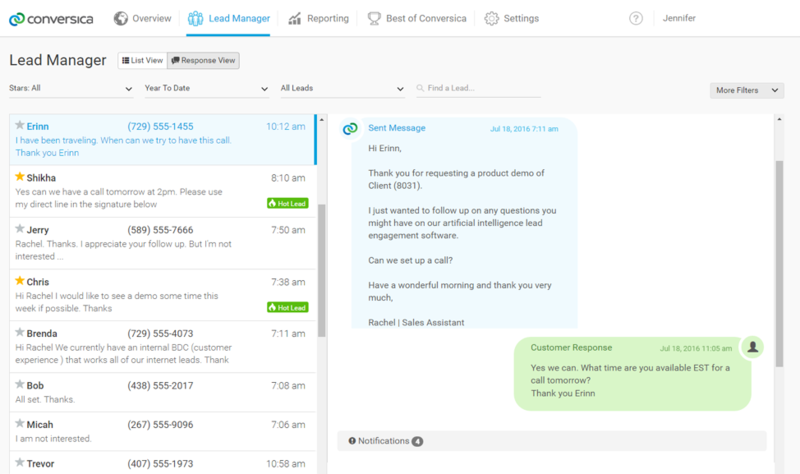 Users can easily respond to customer inquiries quickly and efficiently. AI tools allow marketing teams to spend less time on basic tasks and more time advancing marketing efforts. AI will continue to shape technology and business, and marketers must adjust to the changing landscape of an AI-driven world. AI can improve marketing by automating tasks, highlighting patterns in data, and targeting specific consumers with personalized campaigns. Integrating AI into current campaigns and everyday work will be advantageous for marketing teams and will allow them to connect with consumers in innovative ways.